Midgley Pace Egg Play Hebden Bridge, Yorkshire. England. 1970s. 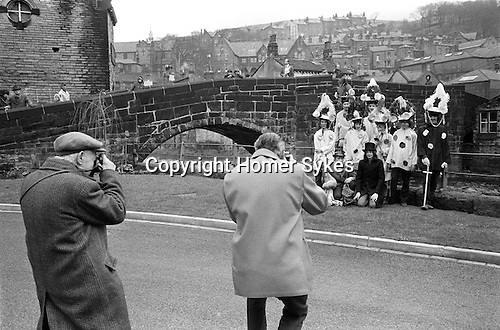 Children of Calder Valley High School who annually perform the traditional Easter Pace Egg Mumming play. 1972. There are several theories to the word ‘Pace’, it is possibly derived from the Latin pascha, literally meaning Easter, or the Hebrew word for Passover. Or alternatively it may simply be a dialect form of the word "peace". The Pace Egg Play is a traditional village Mumming play that some researchers believe can be traced back to Celtic, Egyptian and Syrian traditions. However the first recorded text of a play of this type is as late as 1738. It is unusual for the play to be performed at Easter, as it is in West Yorkshire. In most parts of England the plays are performed during Christmas, New Year or on All Souls Day in November. The play is nearly always performed by men and boys, at various out door locations around their community. Passed down over generations the Pace Egg Play has changed, but central to all variations of the play are the hero and villain usually St George and the Black Prince, who take part in a fight one of whom is subsequently wounded or killed. A Doctor is then called for and he resurrects the fallen hero. This it is believed symbolises the emergence of Spring and its victory in battle over Winter. The plays characters today differ slightly from region to region. In the Midgley version the characters are, a Fool, St George, Bold Slasher, Doctor, Black Prince, King of Egypt, Hector, Toss Pot and the Bugler, and is performed by school boys from Calder Valley High School at Midgley. Their costumes include strange headgear comprising a towering edifice garlanded with paper flowers. The Midgley play was revived in 1932 thanks to the local journalist and historian Henry Harwood.